← Up The Ridge at Last! I’m always very happy when I learn that my waffling on either my blog, or Facebook, has interested someone enough to try Geocaching. I was even more delighted when someone I had met only very briefly six years ago contacted me to let me know that they had just started and perhaps we could meet up and do some caching together. So came about our very pleasant day together. Bugsby14 (Caroline and Alan) are from the other side of Basingstoke; we hail from Camberley when we are at home so I dropped a pin in the middle and came up with Greywell especially as there seemed to be an extremely nice pub where we could meet up which was only a few hundred metres from the start of what looked a nice loop of caches. 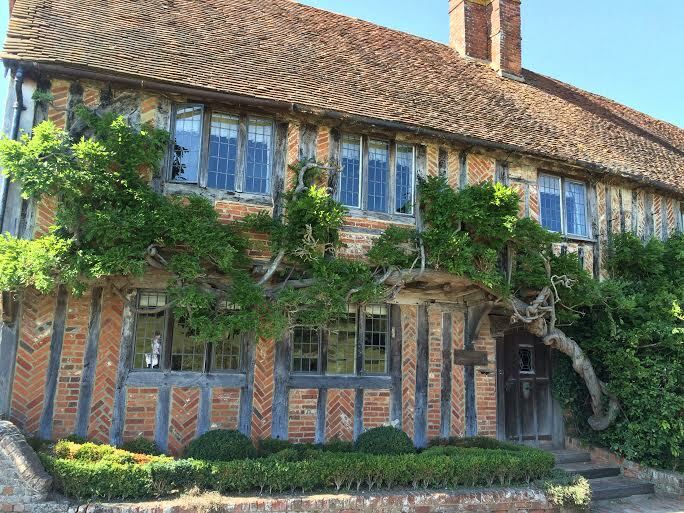 I couldn’t have picked a better pub than the Fox and Goose at Greywell; a small tranquil village in Hampshire, as apart from being a gloriously sunny day, the large grounds perfectly suited our guests Jampo and Bugsby. 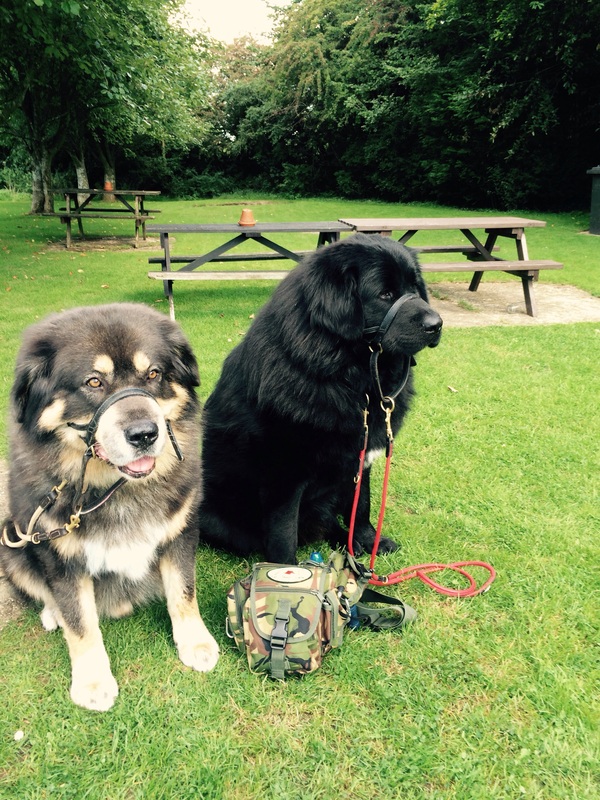 These two beauties are Tibetan Mastiffs; the black one Bugsby is the puppy and has not finished growing yet! Being used to Golden Retrievers and Springer Spaniels both of whom are still bouncing with energy after a full days beating, it was lovely to see these enormous, noble creatures gently walking along with us (sometimes stubbornly). They really were gentle giants with such amazingly thick coats, beautifully groomed and these dogs have been bred for thousands of years for their working abilities which include guarding, alerting through barking, patrolling and basic territorial/dominant behavior. Whilst Jampo and Bugsby sat guarding our Geobag, us grownups enjoyed a coffee and a general chit-chat getting to know each other as we had only met very briefly all those years ago. We found that we had a lot in common and were all eager to start geocaching. Our nearest cache Hough Hunterz took us through the lovely little village of Greywell passing some really old properties. The size of the Wisteria on this old building makes me want to return in the spring to see it in full bloom. Hough Hunterz was soon found and we carried on the narrow road towards PJ&L which, again, was a nice easy find but which we were pleased to see was the start of the lovely walks off-road through the beautiful countryside. Climbing slightly, we now headed towards Misty’s Muskateers which was hidden in a copse at the top of the hill. 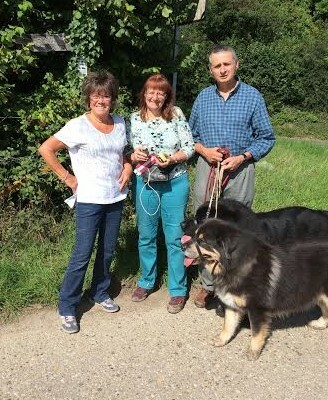 Caroline and I eagerly dived in the copse to retrieve the cache whilst Cockrobbinn and Alan gently strolled up the hill behind us! This set the theme for the rest of the day; the girls in front whilst the men set the world to rights bringing up the rear. The next few caches were 8p4l, Suffering Succocache, Buddy Cache, and Omiwahn. We found them all fairly easily although my brain seemed to have stopped working for a while as I just couldn’t work out what ICT stood for. I also found out what Tibetan Mastiffs are really good at when Caroline had trouble getting over a wide ditch; the dog just stood there as solid as a rock and enabled her to grab him and get over safely. Our next cache was Minesweeper and I awarded this a favourite point. Another ICT (this time I knew what it meant!!) but do you think we could find the cache. 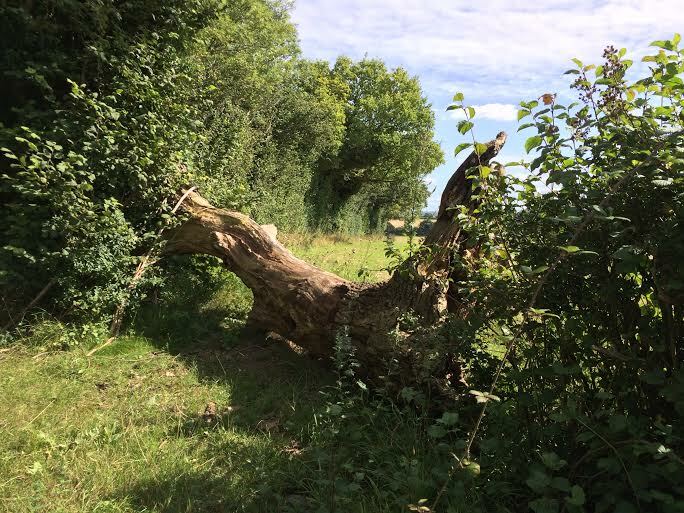 It was a very large tree and Caroline and I searched for what seemed like ages, going around and around it getting scratched on our bare arms and stung by nettles. We were almost at the point of giving up (the dogs were enjoying the rest in the shade and they didn’t mind, but the men were getting restless) when I suddenly spotted the critter hiding deep within the tree. I’d love to publish a picture of this cache but it would give the game away too much. Stunning views walking towards our next cache entitled Teddie. Perhaps the cache is named after one of the cachers met by the CO as it is a tribute series. We looked long and hard – in the wrong place – convinced that it should have been there. The fallen tree made a superb seat which we used whilst checking back on recent logs to try and find a hint. As is often the case, I stood a little way away from GZ and suddenly saw where the bloomin’ cache was hidden. Log signed and on our way again. Our last four finds of the day were fairly uneventful. 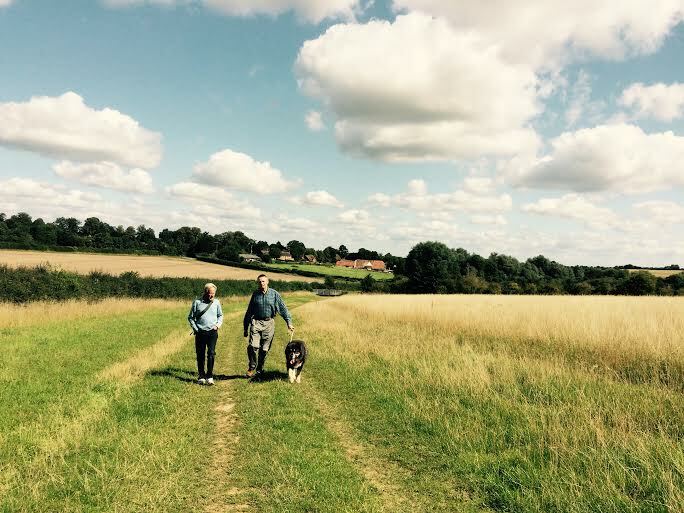 Doyster Randoms #5 – Forked Off, Penwood Plodder, Tadley Trailblazer and finally Doyster Randoms #4 – Puncture Repair. I really liked Penwood Plodder as although it was only a 35mm film canister, it was very cunningly concealed. As this cache was between a bridlepath and a field, I decided to nip into the field to ‘spend a penny’ and promptly managed to squat on some stinging nettles. Not a comfortable experience. It was a short walk back to the Fox and Goose where we watered the dogs, and thoroughly enjoyed a meal sitting out in the spacious grounds, deciding that we must all meet up again in the future to continue the caching experience.